Tell me I don’t have the best job! Each week I’m inspired by delightful interactions between babies as young as 3 months old during my parent/infant classes at Resources for Infant Educarers (RIE). Just when I think I’ve seen it all, they show me something new. 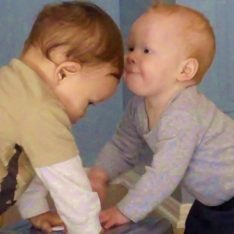 This was a first for me: a 4-month-old boy perfectly echoing his enamored friend’s “hello”. After observing infants and toddlers engaging in play for close to twenty years, it stuns me to still hear parents (and even some experts) comment that independent play isn’t healthy, desirable or even possible for infants. 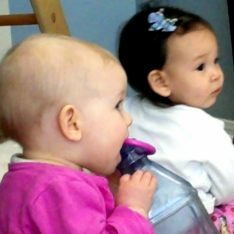 When advisers insist that infants need to be in our arms or carriers for most of the day — implying that they shouldn’t initiate activities or engage with their environment without adult direction — you can only assume that these experts have never spent time observing freely moving infants. But babies shouldn’t be just plopped down to play. They are only comfortable leaving our arms when they have gained the sense of security and confidence we nurture through our respectful communication and attuned care. 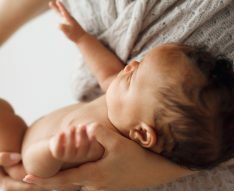 Attunement during play time means observing and listening to our infant’s cues, asking questions and allowing our baby time to indicate readiness before we pick her up or place her down to play. If she’s obviously not in the mood that day (or moment), we ask if she’d like to be picked up again for a little break while we stay seated on the floor. We may discern a specific need (like gas or hunger), address it, and then afterwards try letting our baby play again if she seems interested. For babies and toddlers especially, familiarity and predictability breed confidence, so offering play opportunities in the same place, at the same general time, and with the same children and adults makes it far more possible for play to flourish. Some babies are more sensitive to new situations and need plenty of time to look around from the safety of our arms. Trust their process. Young children always do the best they can in any particular situation on any particular day. For our baby’s peer play to blossom, we must let go of our ideas, agendas, worries and accept whatever happens (safety permitting, of course). When young children sense something other than trust and acceptance emanating from their parents or caregivers, they’re far less likely to be comfortable venturing away from us. Again, be patient, accepting and trust. My favorite part of each of our 90-minute RIE classes is “quiet observation time”, because that is when the magic happens (or at least when we notice it). It’s easy to forget how overwhelming and over-stimulating even our “inside voices” can be for young children. Some days the children might seem a little cranky and out of sorts, and then we realize that the volume in the room is way too high. When we are quiet and observant, babies are more inclined to become intently focused on their inner-directed activities, and we are inclined to learn an incredible amount while enjoying and appreciating them immensely. Enjoying these play experiences and discoveries with our babies is a brilliant way to bond. For more details about forming playgroups of your own, please read The Baby Social Scene – 5 Hints for Creating Safe and Joyful Playgroups. Love this, Janet and can’t stop watching all of your videos! (again) Thank you! I’m so glad you posted this. My little 3 month old has been saying “Hi” for a few weeks! It’s so sweet…and unbelievable. But I know she is trying to communicate. Others have heard it too. This is so wonderful and to the point. I share this same joy and wonder every day with the children in my care. We, at Tumbleweeds, draw a lot of inspiration from your blogs and use them to compliment the work we are doing. For that reason we have nominated you for a Very Inspiring Blogger award. Thank you for your wonderful work! Honestly, reading parenting blogs usually makes me feel guilty. I am a new Mom to a very happy four month old (as long as I’m doing whatever he wants me too). I can’t tell you how it felt to hear that it’s okay for me to leave the little guy for a few minutes to take care of myself. I can tell all of the days of not getting to brush my teeth or not going to the bathroom until I can’t stand it are wearing on me. (Not to mention eating or drinking). If I understand correctly, according to your philosophy, I would have a routine where I do the same thing at the same time each day, let him know what I’m going to leave him for a few minutes while I get dressed, and then tell him I understand that he didn’t like it that I left? I somehow posted this on the wrong blog post. It was supposed to be on the yelling one. Oops!